This Product Order Supplies the Following BOM (Less Foundation and Installation) in accordance for Use as a Bracketed 90 Foot ROHN 25G Tower with EPA's (Effective Projected Area) Ratings for 70, 80 or 90 MPH (No Ice). Refer to Larger Image, Brochure or Footer Links at the Bottom of the Page below for Ice Loading and EPA Information. This 25G Tower is to be used in a Wall Bracketed Configuration according to Use and Foundation Specifications in the ROHN Catalog. This Height Configuration relies on a SB25G5 Imbeded in a Concrete Foundation Specified by Engineering. As a Wall Bracketed-Properly Mounted Structure, a 70, 80 or 90 MPH rated 25G Tower can rise to a maximum of 100 feet. Consult ROHN 25G Catalog Links of the Footer Section at Bottom of Page for more ROHN 25G Tower Configuration, Foundation and Grounding Detail Information. The 25G Bracketed Tower can be installed adjacent to buildings using a bracket to secure the tower in one or two locations along the height of the structure. 8. The interface of tower brackets to supporting structure is to be designed by others and must support a minimum horizontal force of 815 lbs. This ROHN G-Series Bracketed Towers Guide will answer many questions you may have on this Product Line. For more detailed information and Specification Sheets covering many aspects of Various Parts, Accessories and Installation Scenarios... 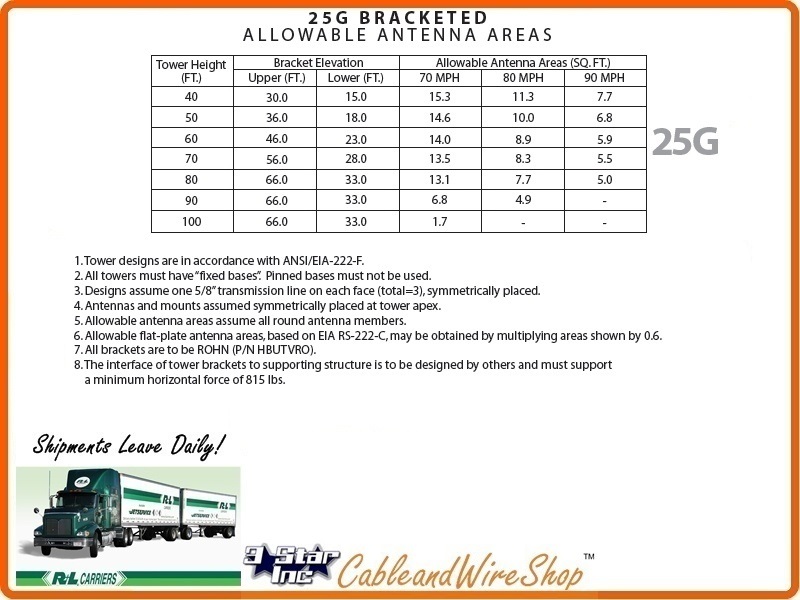 Please refer to the "ROHN 25G Tower" Link appearing in the Footer of this Page Below!